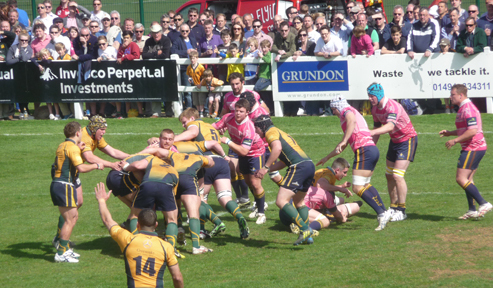 Henley Hawks swept aside the challenge of Worthing Raiders to win promotion to National Division 1 as champions of National 2 (South) before a record crowd, for Dry Leas and National 2, of 3,270. They did this with the free flowing rugby that they have played all season and with eight tries in this game had a record total of 185 tries for 2012/13. This was, as with all their games which has seen them unbeaten at home all season, built on a magnificent team effort, with the forwards showing increasing dominance in set pieces, mauls and loose play providing the opportunities for what has to be the fastest back division in the league to run in tries from anywhere. The opening phases of play were in the Hawks territory. Quite often the Hawks have taken a little time to settle and this was again so in this game with the Raiders taking an early lead when they scored a try by flanker Sam Hewitt from a ruck on the Hawks line which was converted by the reliable boot of scrum half Joe Govett. As always the Hawks immediately responded and after Martin Nutt had been stopped near the Worthing line the Hawks forwards drove for the line but Raiders prop Joe Burns attempted to halt this by pulling down in the maul. Referee Tom Davis had no hesitation in awarding a penalty try which was converted by Will Robinson to make the score 7-7. With a man advantage the Hawks were now presented with a golden opportunity to turn the game and were on the front foot which otherwise may have been more difficult to achieve. Immediately the Hawks half-backs used the opportunity to run the back at Worthing and the ball was moved wide to wing Jason Holmes to use his electric pace to out flank the cover defence. Robinson, who was in fine form in this game with a mature all round performance, converted, one of six conversions in the game, which made the score 14-7. The Hawks took further advantage of Burns’ stay in the sin bin when a poor throw in from a line out by the visitors gave the alert Robbie Staley the opportunity to gain possession and dive over from about five metres for his eighteenth try of the season. With half-time approaching the Hawks were now keen to get a fourth try and bonus point before the break something they have done frequently this season. After a Holmes run had not succeeded some brilliant back play, involving an elusive Tom Allen, Xavier Andre was put through to score the first of a hat trick of tries – a good example of his powerful finishing. Previously Govett had kicked the first of two penalties to make the score at half-time 28-13. Both teams started the second half with a man short as in injury time before the break Hawks’ Matt Payne and Worthing prop Pete Cleveland had been invited to spend ten minutes in the sin bin by the referee for a close encounter. However after Andre had been stopped close to the Raiders line the Hawks showed their authority in the resultant scrum in driving Hugo Milford Scott over for an unconverted try. Robinson’s impressive kicking out of hand kept the visitors at bay and soon Allen was able to set-up Andre for his second try which being unconverted made the score 38-13. However for the first time in the game Worthing were able to set up attacking positions when Hawk’s prop Milford Scott was given a yellow card. No. 8 Rob Smith was able to force himself over for a Worthing try which was converted by Govett to make the score 38-20. Robinson kept the Hawks’ score ticking over with a penalty to make the score 41-20. But the Raiders were now showing some confidence to attack and the spearhead of his was scrum-half Govett who made a couple of darting breaks. However the second of these led to the most sensational score of the game. Govett made good progress towards the Hawk line and was no more then five metres from it when he off loaded an inside pass. This was however snapped up by Holmes who took the opportunity to turn defence into attack and break in field to feed skipper Nutt who continued to make impressive progress before setting Andre away to score his third try so completing a 90 metre movement which was so typical of the Hawks appetite to run the ball. The score was 48-20 which meant the Hawks had truly erased the memory of the 49-5 defeat at Worthing in November however the Sussex side engineered their best try of the game through centre Luke Peters. It was fitting, however, that the Hawks had the last say. This they did when Robinson fed Allen in mid-field with the Worthing defence not properly aligned. This was meat and drink to Allen who started on one of his elusive darting runs leading the visitors astray before finishing on a typical arching run to touch down behind the posts for Robinson’ s conversion to make the final score 55-27. This brought the Hawks’ record season to a close. It was a game which was a tribute to the entertaining rugby they have played all season. Their supporters have revelled in it and played their part.